Antoine Griezmann scored twice to salvage a draw for Atletico Madrid against Malaga in La Liga. The result leaves Atletico nine points behind leaders Barcelona while Valencia, who play on Monday, are four points behind the defending champions. 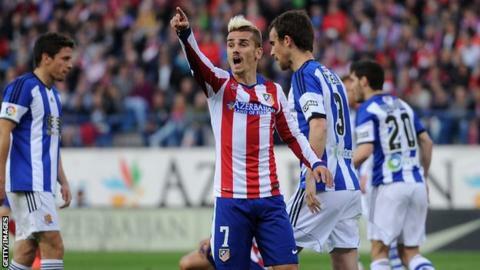 French forward Griezmann opened the scoring before team-mate Fernando Torres headed into his own goal. Samuel Garcia put Malaga ahead with 20 minutes to go but Griezmann got the equaliser seven minutes later. Atletico play neighbours Real Madrid in their Champions League quarter-final on Tuesday. They were gifted the opening goal as Malaga keeper Carlos Kameni flapped at a long throw by Jesus Gamez and Griezmann was handed a simple tap-in. Torres then scored an own goal after heading in a corner just before half-time. Garcia chipped Atletico goalkeeper Jan Oblak before Griezmann responded with a clinical finish to score from the edge of the six-yard area after Malaga failed to clear the ball. Match ends, Málaga 2, Atlético de Madrid 2. Second Half ends, Málaga 2, Atlético de Madrid 2. Substitution, Málaga. Javi Guerra replaces Nordin Amrabat. Offside, Málaga. Fernando Tissone tries a through ball, but Nordin Amrabat is caught offside. Attempt blocked. Recio (Málaga) right footed shot from outside the box is blocked. Assisted by Ricardo Horta. Antoine Griezmann (Atlético de Madrid) is shown the yellow card for a bad foul. Ricardo Horta (Málaga) wins a free kick in the defensive half. Nordin Amrabat (Málaga) wins a free kick in the attacking half. Substitution, Málaga. Ricardo Horta replaces Samu Castillejo. Attempt missed. Sergi Darder (Málaga) left footed shot from outside the box is high and wide to the right following a corner. Corner, Málaga. Conceded by Jan Oblak. Attempt saved. Nordin Amrabat (Málaga) right footed shot from outside the box is saved in the bottom right corner. Assisted by Arthur Boka. Attempt saved. Saúl Ñíguez (Atlético de Madrid) right footed shot from the centre of the box is saved in the bottom left corner. Assisted by Raúl Jiménez. Attempt missed. Arthur Boka (Málaga) left footed shot from long range on the left is too high. Foul by Cani (Atlético de Madrid). Weligton (Málaga) wins a free kick in the defensive half. Attempt missed. Nordin Amrabat (Málaga) right footed shot from outside the box is close, but misses to the left. Assisted by Samuel. Substitution, Atlético de Madrid. Cani replaces Arda Turan. Weligton (Málaga) is shown the yellow card. Goal! Málaga 2, Atlético de Madrid 2. Antoine Griezmann (Atlético de Madrid) left footed shot from the centre of the box to the bottom right corner. Assisted by Raúl Jiménez with a headed pass. Tiago (Atlético de Madrid) wins a free kick in the defensive half. Foul by Samu Castillejo (Málaga). Substitution, Málaga. Fernando Tissone replaces Juanmi. Substitution, Atlético de Madrid. Raúl Jiménez replaces Gabi. Foul by Jesús Gámez (Atlético de Madrid). Goal! Málaga 2, Atlético de Madrid 1. Samuel (Málaga) right footed shot from the centre of the box to the centre of the goal. Juanfran (Atlético de Madrid) wins a free kick in the attacking half. Substitution, Atlético de Madrid. Saúl Ñíguez replaces Fernando Torres. Sergi Darder (Málaga) is shown the yellow card for a bad foul. Foul by Sergi Darder (Málaga). Antoine Griezmann (Atlético de Madrid) wins a free kick in the defensive half. Weligton (Málaga) wins a free kick on the left wing. Attempt saved. Juanmi (Málaga) header from the centre of the box is saved in the centre of the goal. Assisted by Samuel with a cross.